Born to Irish immigrant parents in the town of Roxbury, neighboring Boston, Sullivan apparently inherited his solid physique—he was 5’10” tall and weighed 190 pounds—from his mother, who equaled her grown son’s stature. Sullivan’s father, although an aggressive scrapper himself, was barely 5’3”. A versatile athlete, Sullivan played semi-pro baseball in the Boston area. The Cincinnati Red Stockings offered him a contract, which he declined. From an early age, Sullivan showed great proficiency with his fists. As a teenager, he would fight in Boston barrooms, issuing a challenge that he “could lick any man in the house.” Sullivan turned to fighting more seriously at the age of eighteen when he engaged in three- and four-round amateur bouts. In 1878, he knocked out Cockey Woods in Boston in his pro debut. In 1880, he boxed exhibitions with noted scientific boxer Prof. Mike Donovan and former champion Joe Goss. Sullivan outclassed them both. The next year he scored an eight-round knockout over John Flood. Fighting on a barge in the Hudson River to evade the authorities, Sullivan made short work of Flood, knocking him down eight times. Both fighters wore tight, unpadded gloves. The next year Sullivan met Paddy Ryan, the heavyweight champion—at least in American eyes—in Mississippi City, Mississippi. It was a bare knuckle contest. Sullivan dominated the fight and knocked Ryan out in the eighth round with a right to the jaw. In addition to his regular bouts, Sullivan went on an American tour, challenging anyone to stay in the ring with him for four rounds for a $1,000 prize. He took on all comers. Only Tug Wilson, an English fighter, went the distance. In 1889, Sullivan fought one of his most famous bouts with Jake Kilrain in the last significant bare knuckle bout in boxing. Kilrain was hailed by Richard Fox, the publisher of the Police Gazette, as the new champion. Fox disliked Sullivan for a perceived slight in a bar and had long searched for an opponent to topple him. Sullivan’s weight had ballooned to 240 flabby pounds, and he went into extensive training with champion wrestler William Muldoon to trim down to 205. In the fight, Sullivan got off to a good start by tripping and hip-tossing Kilrain to win the first two rounds. Sullivan was thrown in the third. From then on, Kilrain fought on gamely but Sullivan had the better of it. Beaten and battered, Kilrain could not come to scratch for the 76th round. Sullivan did not fight for three years after the Kilrain match and instead toured as the hero in a mawkish play called Honest Hearts and Willing Hands. He continued to box in exhibitions, and to carouse. In one exhibition, against Jim Corbett, both fighters sparred in full evening attire. 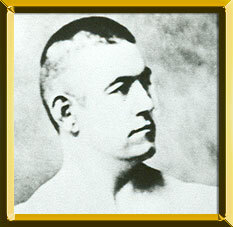 In 1892, Sullivan faced Corbett in earnest in New Orleans as part of the Carnival of Champions, fought under the Queensberry Rules. The fighters wore five-ounce gloves. The contrast in styles was obvious. The powerful, steadfast Sullivan had little use for ring trickery or defense, while Corbett was known for his peerless boxing ability. Young and agile, Corbett outboxed Sullivan, who was out of condition as a result of his indulgent lifestyle. Corbett stayed clear of the champion for twelve rounds. By the seventeenth, Corbett’s forays were wearing Sullivan down and he had a clear advantage. Corbett knocked out Sullivan in the 21st round. Sullivan never fought again. He did some acting and, surprisingly, swore off alcohol. Previously known for his prodigious drinking, Sullivan became a temperance lecturer. He retired to a Massachusetts farm, having depleted most of the $1 million he had earned in his public career. Sullivan’s vast renown and charismatic style did much to advance the sport of boxing in America.